Protein Urine - URS-1P - URS-1 urine test |FDA-CE| 818-591 3030,USA. Los Angeles-based Diagnostic Automation/Cortez Diagnostics, Inc. offers a Urine Reagent Strip (Urobilinogen-Blood-Ketone-Glucose-Protein-pH-Bilirubin-Nitrite) Rapid Test for the semi-quantitative and qualitative detection of Urobilinogen, Blood, Ketone, Glucose, Protein, pH, Bilirubin and Nitrite in urine.Â The Urine Reagent Strip for Urinalysis is for in-vitro diagnostic use only. The Urine Reagent Strip (Urobilinogen) Rapid Test is based on a modified Ehrlich reaction in which p-diethylaminobenzaldehyde reacts with urobilinogen in a strongly acid medium.Â This test will detect urobilinogen in concentrations as low as 0.2 EU/dl in urine. The Urine Reagent Strip (Blood) Rapid Test is based on the pseudoperoxidase action of hemoglobin and erythrocytes which catalyzes the reaction of 3,3', 5, 5' -tetramethyl-benzidine and buffered organic peroxide.Â Â This test has a sensitivity to free hemoglobin of 0.015 mg/dl, or 5-10 intact red blood cells/uL urine. 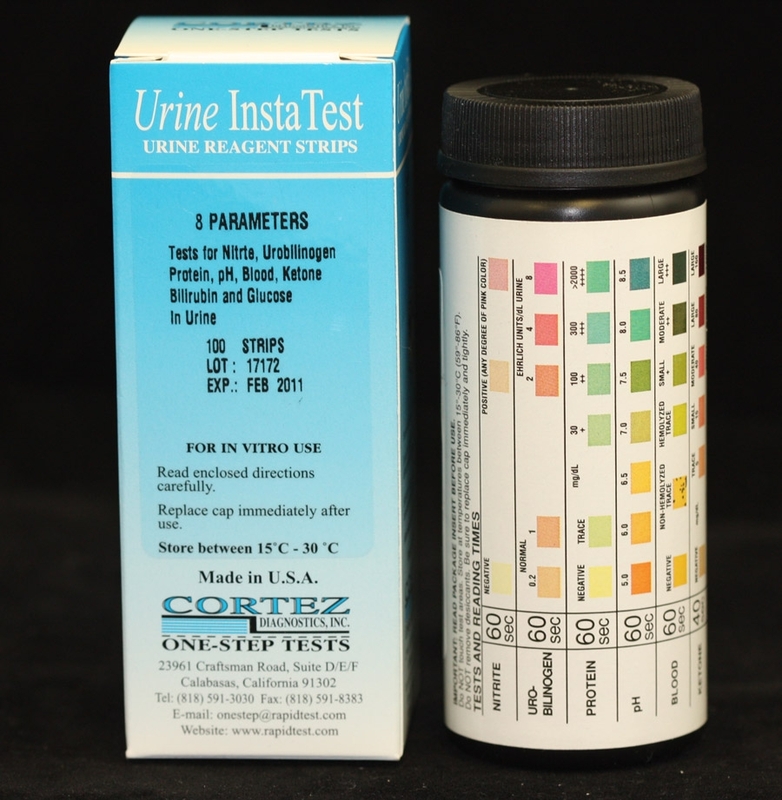 The Urine Reagent Strip (Ketone) Rapid Test is based on the reaction of acetoacetic acid with sodium nitroprusside in a strongly basic medium.Â The sensitivity of the test provides semi-quantitative results and reacts with acetoacetic acid in urine.Â This test does not react with beta-hydroxybutyric acid or acetone.Â The reagent area detects as little as 5-10 mg/dl acetoacetic acid in urine. The Urine Reagent Strip (Glucose) Rapid Test is based on a double sequential enzyme reaction.Â Â Â The test area is specific for glucose; no substance excreted in urine other than glucose is known to give a positive result.Â Approximately 100 mg/dl glucose in urine is detectable. The Urine Reagent Strip (pH) Rapid Test is based on the well known double pH indicator method, where bromothymol blue and methyl red give distinguishable colors over the pH range of 5-9.Â The test area permits quantitative differentiation of pH values to one unit within the range of 5-9.Â pH reading is not affected by variation in the urinary buffer concentration. The Urine Reagent Strip (Bilirubin) Rapid Test is based on the coupling of bilirubin with a diazotized dichloroaniline in a strongly acid medium.Â The test has a sensitivity of 0.4-0.8 mg/dl in bilirubin in urine. See Urine Reagent Strips for Urinalysis (Urobilinogen-Blood-Ketone-Glucose-Protein-pH-Bilirubin-Nitrite) Product Insert for more specific details on preparation, procedures, storage, quality control, and interpretation of test results. Diagnostic Automation/Cortez Diagnostics, Inc. also offers several other Urine Diagnostic Reagent Test Strips.Â Â For more information about these Urine Reagent Diagnostic Rapid Test Strips, or any other Rapid Test, ELISA Test, CLIA Test kits, Serology test, or IFA Test kits, please contact our Customer Service Representatives at 818-591-3030.